I recently received word that I was accepted to the 2016 Rock N Blog team. 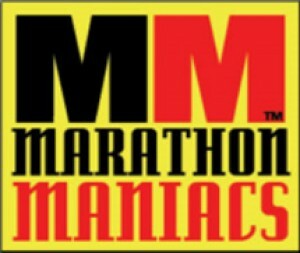 I should have discount codes for all the Rock N Roll Marathon Series races for YOU sometime this week!! 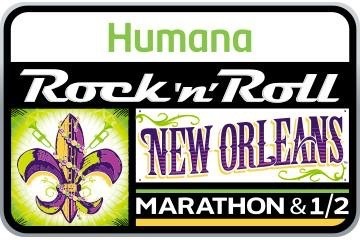 As a result, I hustled to get some RnR races on my calendar! 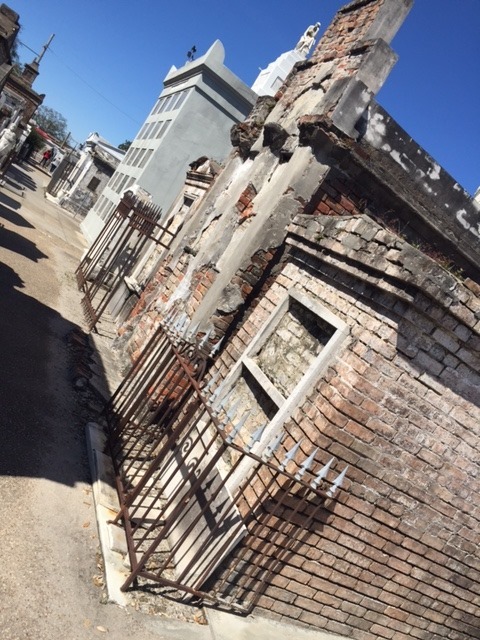 RnR New Orleans has been on my “list” for years and it just so happened to fall on Leap Year weekend this year. Mom and I always travel Leap Year weekend (every 4 years). I didn’t know if she would be interested in a whirlwind trip to New Orleans but she was totally up for it, so away we went!! 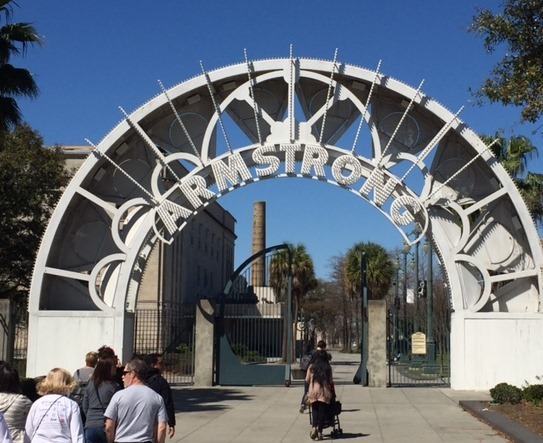 The expo was at the New Orleans Convention Center which is centrally located to the Riverwalk, close to Harrah’s Casino & a short jaunt to the French Quarter. As with all Rock N Roll races, each participant is required to pick up their own packet. We zoomed thru the expo, which was a decent size. 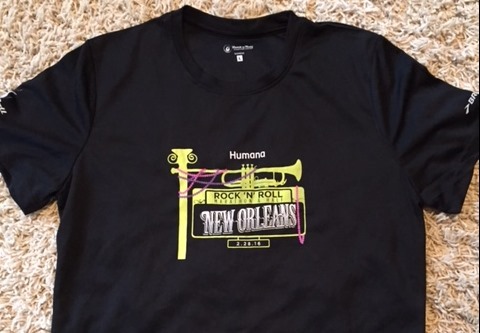 Grabbed my bib, the race tee & I bought a couple RnR items to rep my new team. Race tee below. Black. Gender specific. Brooks Running. This was a fun trip for mom & I, not a run specific trip, so I wanted to spend as little time doing run things as possible. 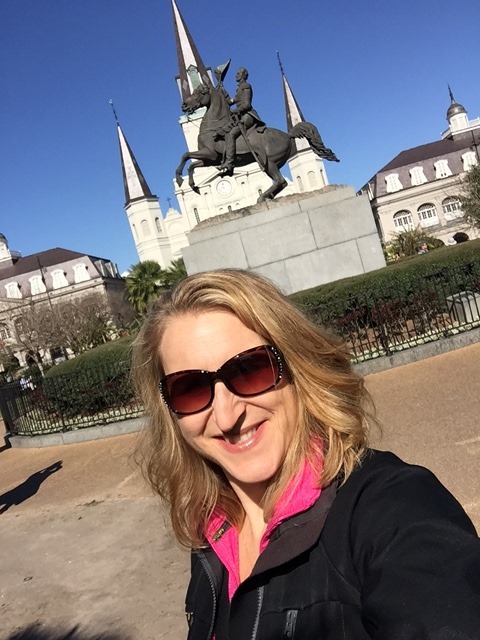 We stayed at the Hotel St Marie in the French Quarter. 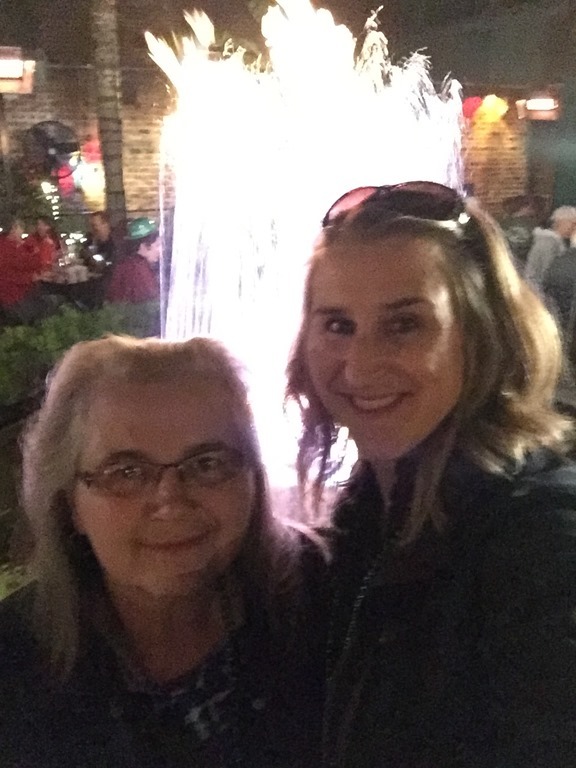 I fell in love with the photos of the hotel on the internet and felt like it was a great place to give Mom a feel of the real New Orleans. We loved it & the ladies at the front desk really took care of us and helped us with finding cool, local places for food and entertainment! 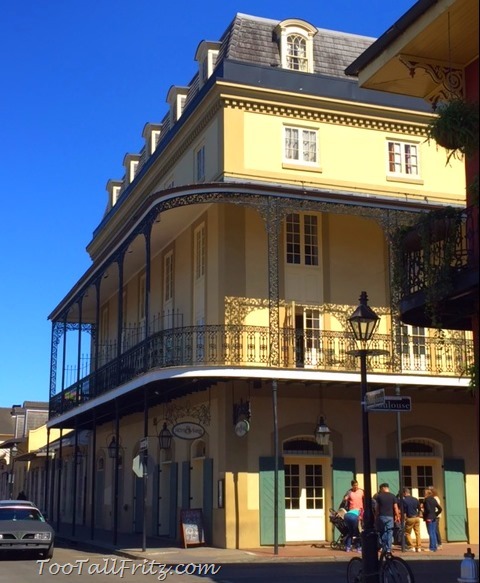 It’s an older, historic New Orleans hotel. A mere half block away from the craziness of Bourbon Street but removed enough that we didn’t hear much of the hoopla. See my pic below, isn’t it a cute hotel? I have to give mom credit. She was so adventurous. She walked and walked and walked. We ate EVERYTHING “New Orleans” that we could possibly consume: Fried & blackened alligator, seafood gumbo, crawfish po’boy, crab stuffed jalapeno poppers, beignets, café au lait, catfish, redfish, shrimp, fried green tomatoes, chicken tchoupitoulas, creole green beans, creole jambalaya, crawfish etouffee, and shrimp & grits….. to name a few. 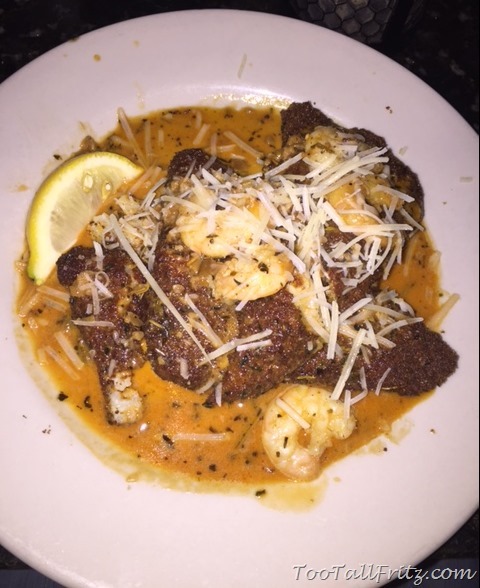 See pic below from the Royal House Oyster Bar of my pre-marathon meal of shrimp & grits. So amazing. Light. Tasty. Tiny bit of spice but nothing overpowering. We also toured the city. Cemeteries. Ghost tours. Parks. And we had a few drinks: café au lait & cocktails …. 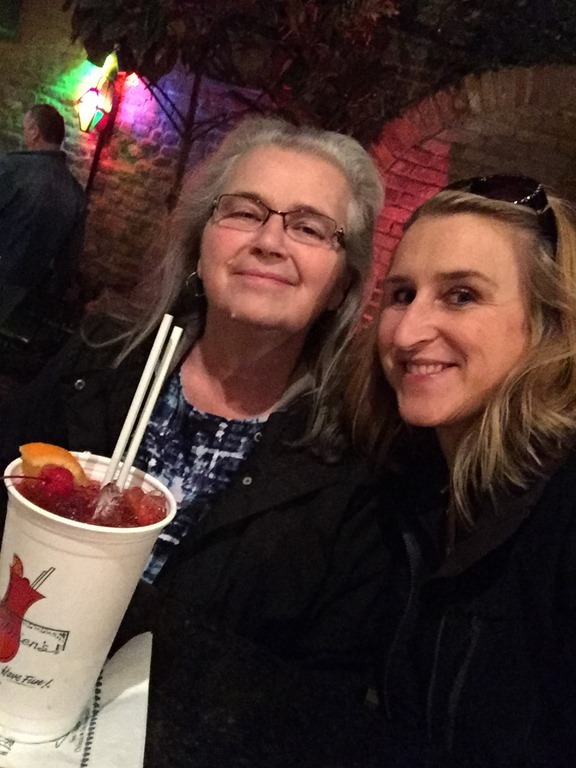 including Mom’s very first hurricane (we could only drink one cuz they were so strong). I even tried a concoction called a “grenade”. Just one of those too. 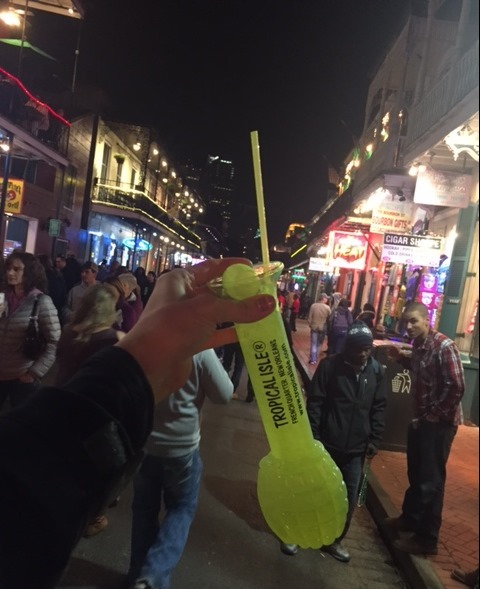 Gotta be careful with the cocktails in the Big Easy!!! 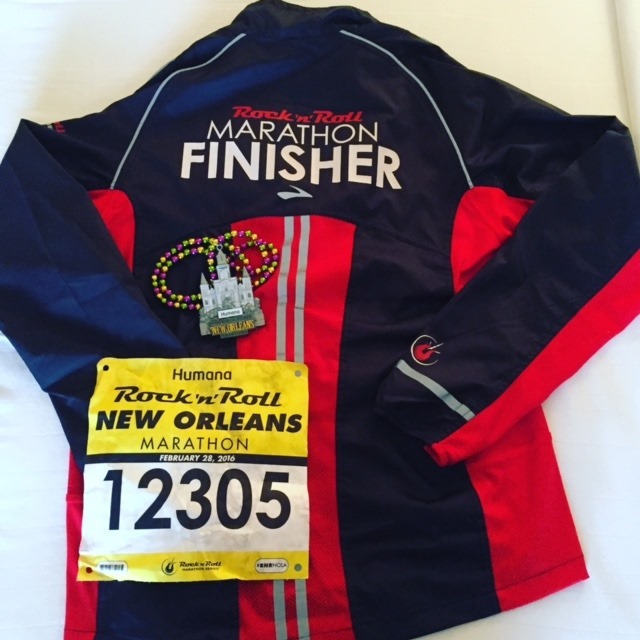 Then as icing on the cake, I got to run the Rock N Roll NOLA Marathon. Race started at 7:30 am but there were approximately 34 corrals. I believe there were just shy of 35,000 bibs sold/registered between the 10K, Half & Marathon. Approximately 2 minutes between corrals. No policing of corrals so some just started where they wanted verses where they were assigned. Then I heard complaints of a crowded course. I did NOT have an issue with the course being too crowded but I DID pass runners the entire way, right up to the finish. So I know that everyone wasn’t where they were supposed to be but I think it bothers me less than some because I just run my race and really don’t worry about what anyone else is doing. I wasn’t going for a specific time. I had my sore hamstring that I was babying, plus I knew the weather was going to heat up to 70+ degrees before the finish. Kinda warm for those of us who left a frozen tundra to head south for the weekend. Those 2 things made me acutely aware that I should neither run too fast nor stress too much about the race. I just tried to run relaxed but at a decent clip while my hamstring held and the temps were cool. I never pushed the pace. I had to stop a couple times to take motrin and add biofreeze to “hard to reach” muscles. I just ran. Happy to be running. 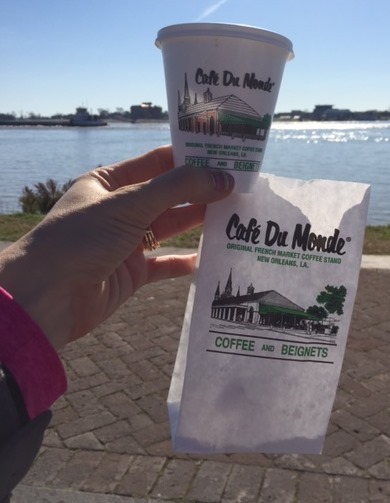 Pleased with the amazing course that toured the Garden District, French Quarter, Decatur Street, Jackson Square, the French Market, City Park and looped over the levies for a rolling out and back next to Lake Pontchartrain. Most of the route was flat. A few rollers by the lake. Mostly shaded course. And I thought it was AMAZING. Every step. I was told it was “boring” the last 10 miles, but I didn’t think that was the case. I loved the breeze off the water by the lake after we left all those amazing shade trees behind. Honestly, I really loved it. And I think you would too. I finished. My fastest marathon of the year so far, 4 hrs 19 minutes. Hoping to improve on that in April but honestly, any day I get under 4:30 is a good day by me! Awesome medal & finisher jacket. I’ve never gotten a jacket as FREE finisher SWAG! So cool!!! RnR races are known for the after party, band and beer garden but to be honest, I always hoof it back to my family. Everyone seemed to be having an awesome time. The beer was flowing and the finish area was set up well to take care of runners. Class act. 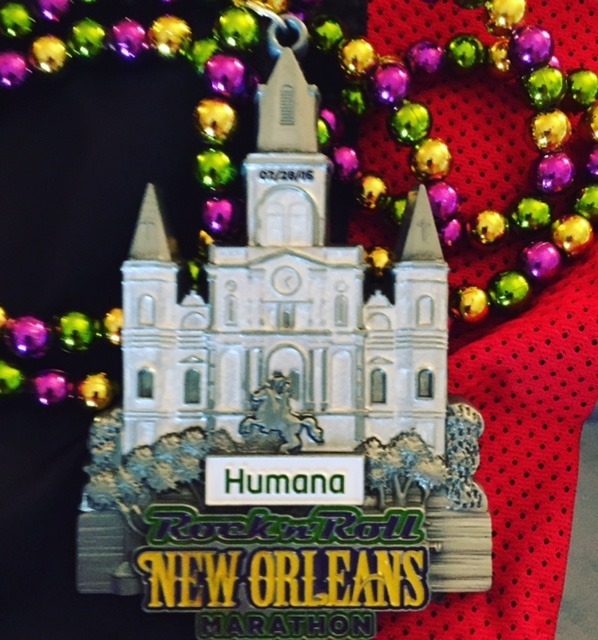 I was very impressed with what New Orleans had to offer both to local tourists and to the RnR runners. New Orleans, you got an “A” for how much you have grown post Katrina. I’m so impressed that I can’t possibly put it into words. You have rebuilt. You are bigger and better. You are now, once again, an amazing city. I hope to be able to revisit soon & run your lovely streets again and again.